Although talk of taxing Canadian lumber brought into the United States may be one reason Americans are moving towards sourcing more of their timber domestically, the availability of domestically-sourced Cross Laminated Timber (CLT) will no doubt be another. CLT—a prefabricated wood panel product consisting of three to seven layers of lumber that's glued together to form incredibly strong structural panels—has been a common residential building material in Europe, and has steadily gaining popularity in the U.S. Previously imported exclusively from Austria and Canada, CLT panels are now being fabricated domestically, and their use is starting to spread—and not just in residential projects. 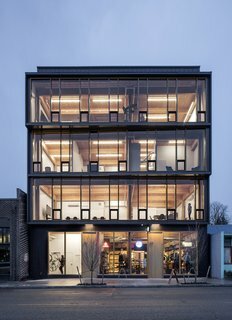 Located in North Portland, Albina Yard is a 16,000-square-foot office building with ground floor retail that's on the cutting edge of architecture. 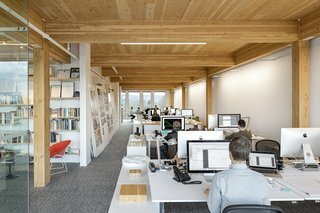 Designed by Architect Thomas Robinson's Portland-based firm LEVER Architecture—who has been leading the way for the use of CLT mass timber constructions in the US—Albina Yard, which opened in September 2016, is the first office building in the U.S. to utilize mass timber construction. 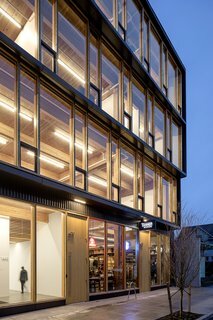 Additionally, the building's glue-laminated timber frame and Douglas fir CLT panels were all locally-manufactured and prefabricated in Riddle, Oregon. The Pacific Northwest is renowned for its miles of dense evergreen forests, and mass timber construction is a more sustainable way of building, while encouraging economic growth in the Pacific Northwest. With their "Forest-to-Frame" mentality, LEVER Architecture has found a niche working with CLT. 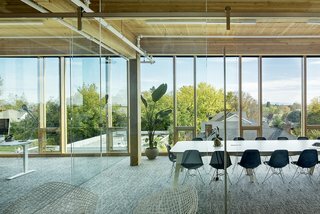 With Albina Yard, LEVER Architecture's primary goal was to utilize domestic CLT in a market-rate office building that would pave the way for a broader market adoption of renewable mass timber construction technologies in Portland and across the U.S. LEVER Architecture's design approach reflects their commitment to this sustainable technology. "For a creative office like this, we wanted more open space, so we combined a CLT floor with glue-laminated columns and beams. They work as a system," explains Robinson about LEVER Architecture's office space. "With CLT, you're building with a sustainable, renewable resource. Trees absorb carbon and emit oxygen as they grow. When you put trees into a building, you sequester that carbon. The more you build with wood, it's almost as if you're managing the forests and you can come up with—in a way—a carbon-neutral way of building." explains Robinson. "For us, as a firm, we're more interested in thinking of ways to create buildings that elevate the human experience. Not only are these buildings sustainable and have a potential great impact on world economies, they're also beautiful places to work," says Robinson. 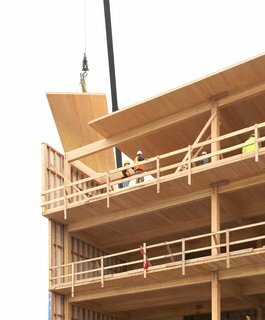 The use of CLT has numerous benefits—the large-scale, prefab, solid-engineered wood panels are as strong as old-growth timber and nearly as strong as steel. The panels can be fabricated from scraps or made from new timber—making them both eco-friendly and cost-effective. CLT is also claimed to be as fire-resistant as structural steel or concrete. Cut to exact specifications, the prefabricated panels are able to be constructed much faster: Albina Yard went up in only four weeks. "CLT structures are like a large-scale version of an IKEA cabinet," explains Robinson. 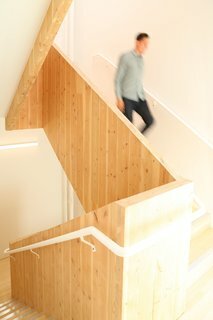 Staircase CLT panels have a three-ply thickness. In 2015, LEVER Architecture's project Framework was awarded a 1.5 million dollar grant from the U.S. 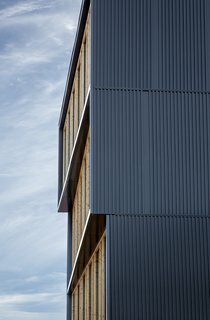 Tall Wood Building Prize Competition. Framework is a 90,000-square-foot, 12-story, mixed-use building that will be built in Portland's Pearl District. The structure is anticipated to be the first timber high-rise in the U.S. and the grant helped to offset the costs of testing and peer review necessary to pursue the project to go beyond what's currently permitted with building codes. Framework is even recognized in the National Building Museum's exhibit Timber City, which acknowledges timber construction's worldwide boom and highlights the many advantages of cutting-edge techniques. The CLT panels successfully underwent strict fire-testing and seismic drift testing, in addition to multiple other tests to ensure that the building material was structurally safe. Located in a mixed residential/light industrial neighborhood, Albina Yard stands out not only because it's taller than most of its neighbors, but the dark wood structure is both imposing and inviting. When we visited Albina Yard during Design Week Portland, one of the first things we noticed upon entering was the amazing scent of the Douglas fir. The material of the structure also gives it an undeniable sense of connection to its roots in the Pacific Northwest. 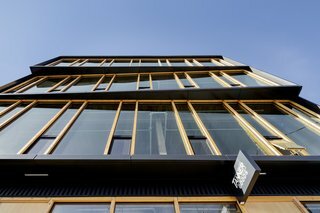 The facade cantilevers out four feet with a four-inch-thick CLT panel, which is the maximum cantilevering capacity of the material. At street level, the floor plan of the building is organized around a small L-shaped infill site. The retail space connects to the street and a café/bar is located in an adjacent courtyard space. The upper floors have expansive views of both Mt. Hood and downtown Portland, and are also divisible into four smaller units. A retail space on the ground floor is home to Portland brand, Tanner Goods. The project also hosts a bar around the back and a creative agency in a container-turned-office space with a green roof. With early adopters, like LEVER Architecture, bringing this cost-effective, eco-friendly and beautiful material further into the mainstream, Albina Yard can be seen as both an innovative vision of the present and the face of the future. The exposed Douglas fir structural frame is aesthetically beautiful, especially when illuminated at night.